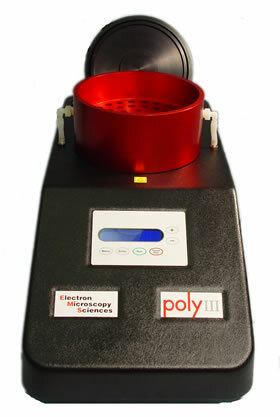 The EMS Poly III is an instrument for the embedding of specimens by the proper combination of pressure and temperature. Central to the instrument is a specimen chamber that is temperature controlled and which can be heated up from room temperature to 70°C. The pressure in the chamber can be reduced from ambient pressure to a controlled level with an inbuilt vacuum-pump. The instrument chamber accepts up to 52 BEEM specimen vials. The vacuum pressure the specimens are exposed to is controlled within narrow limits and warrants solvents will evaporate in a controlled way without the risk of explosive boiling. The exhaust of the vacuum pump is connected to a chemical vapor resistant hose, which can vent into a fume hood in compliance with laboratory practices and general health and safety regulations when working with volatile substances. The instrument features preset programs which can be modified according to the user's preference. In the presets pressure and temperature settings have been coordinated and optimized for an efficient removal of solvent from the specimens eliminating the risk of boiling. Bulk removal of solvent is followed by steps for the thorough removal of trace amounts. As a practical approach the instrument can be loaded by the end of a workday and (when using acetone or propylene oxide) by the next morning the vials are ready for polymerization after the vials have been topped off with pure resin. A lengthy and sometimes tedious manual procedure now reduced to a few simple steps. Alternatively, to free up the instrument for a next run, polymerization can take place in a stove. The instrument is (after cooling) immediately available for a next run. Which solvents can be evacuated with the EMS Poly III? The instrument handles any of the solvents currently used in embedding protocols. In principle any solvent can be safely and gradually evaporated as long as the proper settings for pressure vs temperature are observed. The one important rule is that the pressure should initially NEVER be lower than the saturated vapor pressure at that temperature. Values can be calculated with the Antoine Equation or derived from the graph (Figure 1). For the bulk removal of solvent it is advised to work at a pressure that is approximately 10% higher than the saturated vapor pressure. Failing to do so may lead to sudden boiling of the solvent and spilling of mixture and specimens from the vials. The risk of sudden spilling is higher with more volatile solvents such as propylene oxide and instrument settings need to be accurate. Important: at no stage should solutions be allowed to bubble. Gas bubble formation needs to be avoided to prevent splashing and damage to the specimens when bubbles should form inside the specimen. Although extensive testing has been carried out, specific combinations of solvent and resin need to be tested for their suitability for embedding and polymerization in the EMS Poly III on an individual basis. 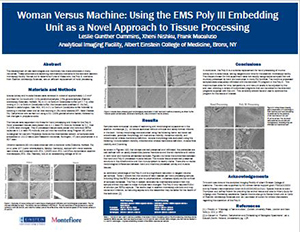 Small specimens are more easily embedded because of their favorable surface/volume ratio. Likewise, solvents are more easily extracted. Along those lines it is obvious that solvent is more easily removed if the specimens are covered (or even just merely contained) in a minimum amount of resin. For instance, when using BEEM capsules it is typically sufficient to end up with 30-50 µI of resin at the end of the embedding run. Using a dilute resin/solvent mixture, or a small volume of mixture in the embedding program leaves the specimens covered in a thin layer of resin by the end of the embedding run, just enough to cover or contain the specimen. A procedure that has been tested for embedding yeast cells is described below and may serve as a starting point. Yeast cells were fixed with glutaraldehyde in cacodylate buffer, washed in distilled water and postfixed with 1% KMn04 in distilled water. After washing in distilled water the cells were dehydrated in a graded series of solvent/water mixtures: 50% - 70% - 80% - 90% -100% - 2xl00% absolute. Each step lasted 10min. Cells are then resuspended in resin/solvent 1:10 (v/v) and after 10 min. pelleted. The pellet is resuspended in fresh mix (appr 1Ox the volume of the pellet) and then transferred into one or more BEEM capsules. It is strongly recommended to transfer the suspension into BEEM vials OUTSIDE the EMS Poly III vacuum recipient to avoid spilling of resin inside the recipient. Any spilled resin on the vials should also be removed before inserting the BEEM vials into the recipient recessions. Once all the BEEM vials have been transferred, the embedding program can start. The embedding program is followed by the polymerization program, after the BEEM vials have been topped off with pure resin. Alternately, silicone molds can be used in the polymerization program. Temperature set point in increments of 1°C. Introduction of fresh air during vacuum cycle and flush cycle.